For a politician, eggs can be an occupational hazard. Australia’s first prime minister, Edmund Barton, was said to have worn a special ‘ova-coat’ to ensure his best clothes weren’t ruined by protesters keen to send him a rather messy message. When Queensland’s Senator Fraser Anning was hit with an egg at a press conference recently, it prompted debate on whether or not it was an appropriate response to a political figure. Senator Anning is not the first Australian politician to face this form of protest. Here are five more notorious ‘eggings’ in Australian history. Famously explosive when roused, few incidents enraged Billy Hughes as much as the famous egg incident at Warwick on 29 November 1917. 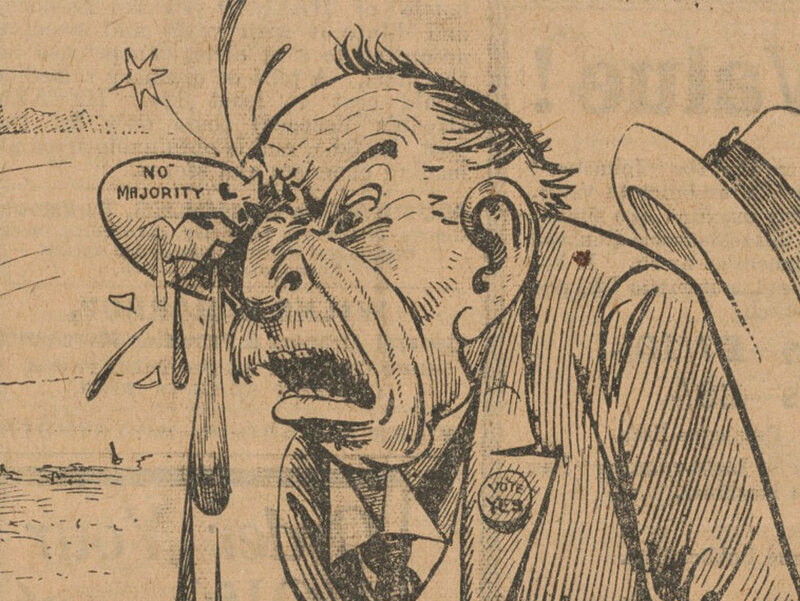 Hughes was touring Queensland, trying to drum up support for conscription in the lead-up to the second national referendum on it, having narrowly lost the first. As Hughes spoke at Warwick railway station, local Patrick Brosnan threw an egg at him, knocking off Hughes’ hat. The irate prime minister made a beeline for the crowd, and even reached inside his coat for a revolver (he often carried one), but found he had left it on the train. Hughes demanded the local policeman, Senior Sergeant Kenny, arrest Brosnan, but Kenny refused, saying that Hughes had no jurisdiction over him. This cartoon by Jim Case lampooned Hughes in the light of his public egging at Warwick by conflating the egg with the Australian response to his conscription proposals. Hughes departed, fuming, and the incident led to the creation of the Commonwealth Police (which became the Australian Federal Police in 1979), to prevent such future incidents. Such a force had been mooted for some time, but the figurative egg on Hughes’ face was the catalyst spurring him to action. During World War II, rationing made life that much harder for many Australians. One man was blamed for the austerity: John Dedman, Minister for War Organisation of Industry. The dour, dispassionate Scot was the rationer-in-chief, and his approach to his job made him unpopular. In 1942 he was even accused of banning Christmas due to restrictions on advertising. On 4 August 1944, Dedman addressed a meeting at the University of Melbourne. A group of students at the back of the room had organised a protest against conscription, and even gave Dedman some warning; they handed him a baseball bat and mask, and told him to defend himself. For nearly an hour, Dedman attempted to speak but faced a barrage which never seemed to end. 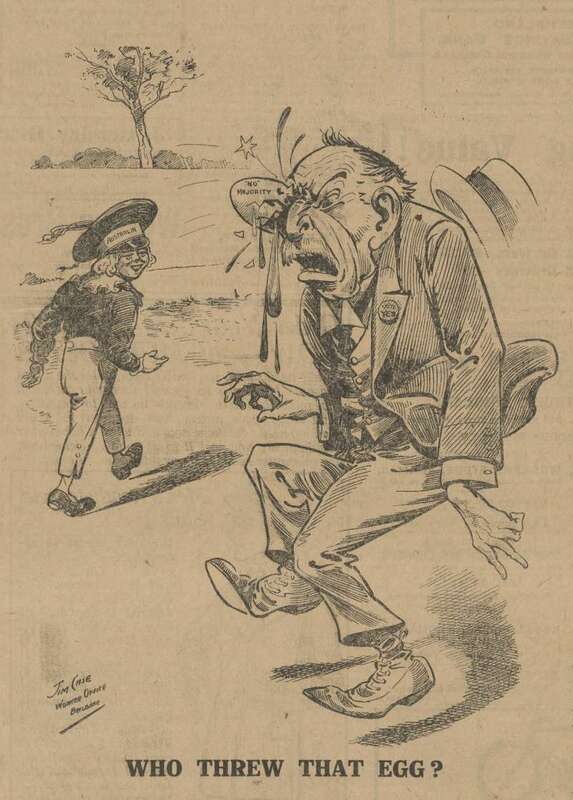 One newspaper reported that by the end, whole fruit was being thrown at the stage, while Dedman all the while wiped his suit down with a handkerchief and kept speaking. Reports also said that, despite the protest from ‘medical students’, the minister received rousing cheers at the end of his speech. these people can’t think straight, and can’t aim straight! Malcolm Fraser was no stranger to an egging, having been pelted with eggs and more during the 1975 election campaign, the controversy following his appointment accompanying him on the hustings. 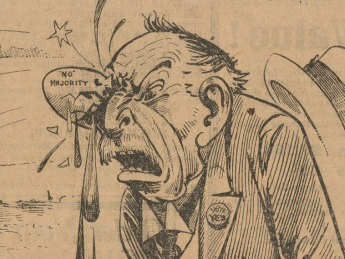 He probably wasn’t expecting, however, to be egged while in the House of Representatives. On 28 May 1981, as Fraser answered a question on the upcoming Commonwealth Heads of Government (CHOGM) meeting, a woman in the visitor’s gallery hurled an egg at the prime minister, missing him by about a metre. She was Kerry Alcorn, the daughter of Labor MP Ken Fry. Alcorn said the egg had been a warning shot, and that had she wanted to harm the PM, she would have done so. Her protest was based on the cost of CHOGM, money she felt could be better used elsewhere. Mr Fry said while he didn’t condone his daughter’s protest, he understood it. “As a member of parliament, I have other avenues of expressing my feelings which other people don’t have,” he told the Canberra Times. 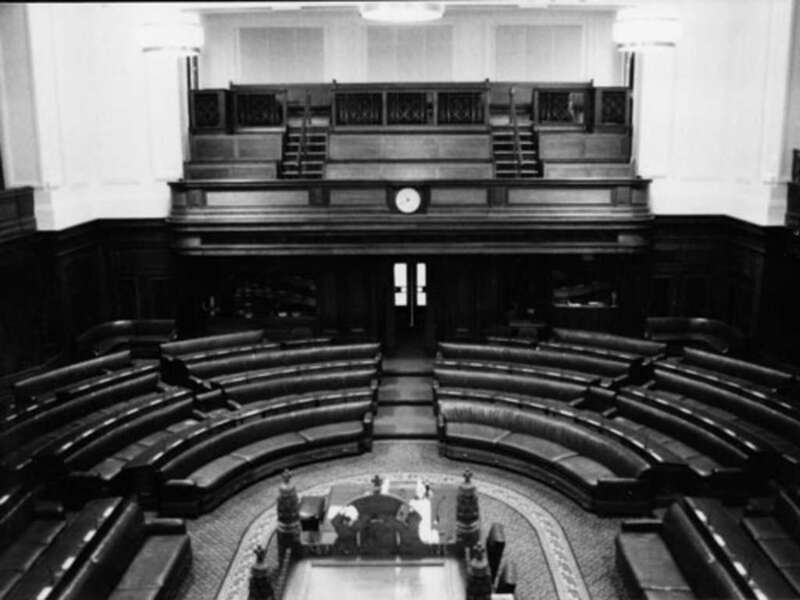 As this 1985 photo shows, there was little physical separation between members of the public and politicians in the House of Representatives chamber. Even today, though security at Parliament House is much tighter, the public galleries are not enclosed, a symbol of democratic openness. The incident sparked a review of security at Parliament House, with some MPs suggesting if someone could throw an egg, they could throw something more dangerous. Despite the incident and others like it, barriers between the public and politicians were never erected in Old Parliament House. The 1993 election campaign, as many Australian elections can be, was vicious. The Keating Labor government went on the attack against Liberal leader Dr John Hewson and his ‘Fightback’ economic plan, which among other measures included an unpopular Goods and Services Tax (GST). Two days before the election, on 11 March, Hewson held his last rally of the campaign. In front of Brisbane town hall, he addressed 7,000 supporters…and 1,000 opponents. A student group had joined the crowd, and as the Opposition Leader spoke, they hurled not only eggs but soft drink cans, apples, tomatoes and even broccoli. As they pelted the stage, Hewson and the Nationals leader, Tim Fischer (and Fischer’s wife, Judy) ducked for cover. At one stage in the proceedings, Hewson managed to catch one of the eggs that had been flung at him. “Those cricketers have nothing on me!” he quipped. Despite his good cheer and polls showing the Coalition as a threat to the government, Hewson went on to lose the election.